Ship internationally fastly, 5-6days well received. Click here to check how to take the measurements! So you will receive this item or items 10-15days after you order! thank you! Payment: we accept paypal, paypal accept you pay by credits carrds, debit cards. Infinity dress: For most occasion and events, especially for bridesmaids for wedding! 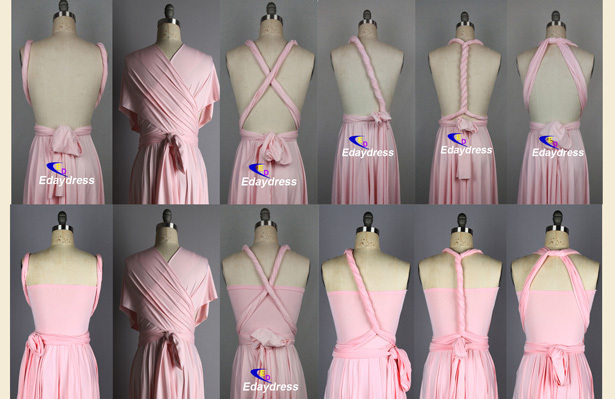 One single dress can be wrapped into many styles! fits for different body shapes and sizes! 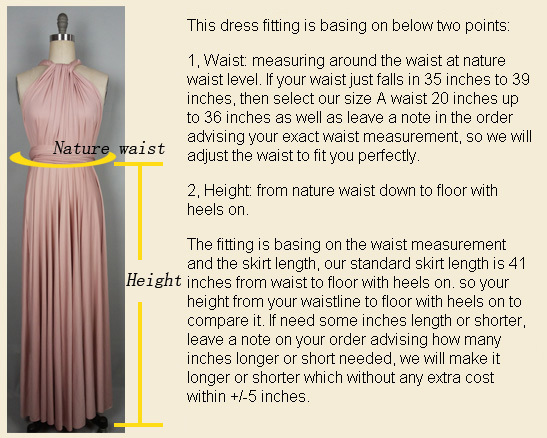 Size A: Waist: 20" up to 36"(your waist measurement is between 20" and 37" also includes 20" or 37",select this size A.) . Skirt standard length is 41"(floor length)from the waistline to dress hem, but can make it longer or shorter WITHOUT any extra charge, just leave a note on your order advising us how many inches longer or shorter than 41" you want, so we will make it longer or shorter as per your request. So check your height from your WAISTLINE to floor with heels on to compare if standard 41" length is perfect, and if need longer or shorter, leave a note on the order advising how many inches longer or shorter need. we will make it longer or shorter accordingly as per your request. thank you! Bandeau: it is free of charge, not need to buy bandeau separately, because each dress comes with one matching bandeau free of charge accordingly. Bandeau size A: 9" long(vertical) x wide(horizontal): 26" stretched to 40". come with dress size A.
Bandeau size B: 9" long(vertical) x wide(horizontal): 32" stretched to 44". come with dress size B. If need longer or wider bandeau, please leave a note on the order advising how many inches longer or wider need. we will make it as per your request WITHOUT any extra charge. 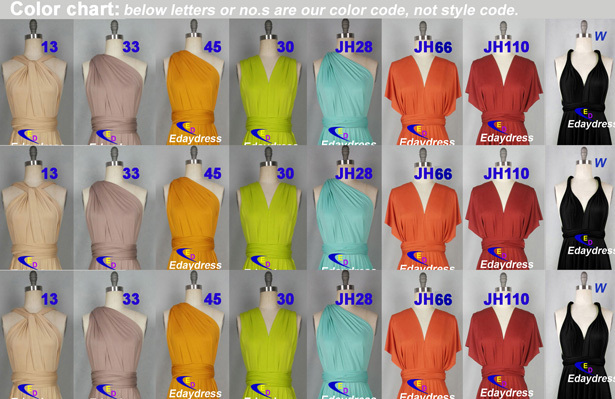 Color: please check the color chart on the list to see which color you want and you will see the color code marked with letter or No. such as K, A, L..28.38..etc for the conerning color. 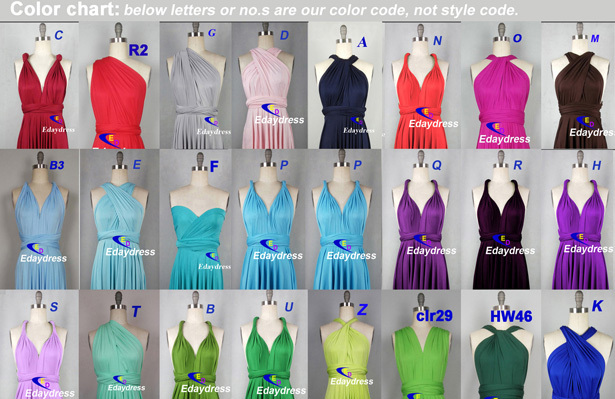 so when ordering the dress/dresses, click the color box and roll down to select the conerning color code for the color you want. 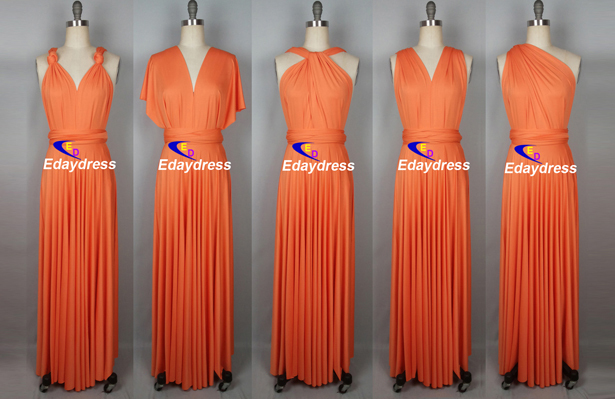 we will make the dress in the color as per your selected color. 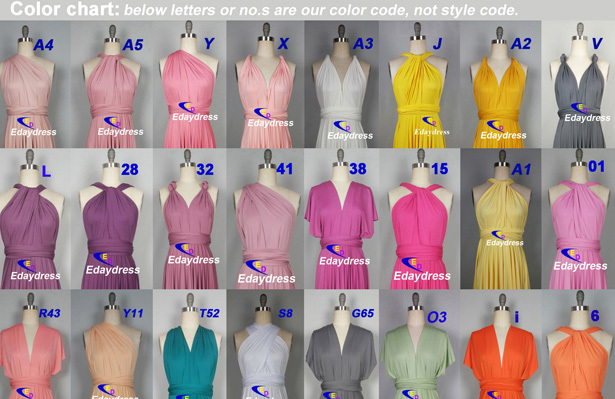 **We have over 70 colors, please kindly find below list to check them and if can not find the color you are after, please kindly contact us. The dresses are amazing!!!! They are perfect for my bridesmaids :) Thank you! I LOVE these dresses! I ordered one to make sure it would fit all three of my bridesmaids and then immediately ordered two more. The quality and feel of this fabric is beautiful. Fast shipping despite the distance. The dress was perfect, thanks! Get discounts and special offers to win gifts and cash prize! Just enter your email address at this form and click subscribe! Copyright @ Edaydress All rights reserved.